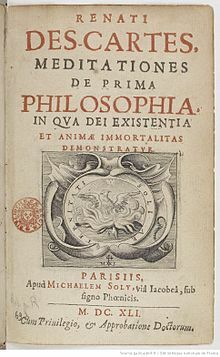 Meditations on First Philosophy In which the existence of God and the immortality of the soul are demonstrated, by René Descartes, was first published in Latin under the title Meditationes de prima philosophia, in qua Dei existentia et animæ immortalitas demonstratur in the year 1641. The French translation by the Duke of Luynes, under the supervision of Descartes was published in 1647 as Méditations Metaphysiques. Following quotes from The Meditations were taken from the John Veitch translation contained in the 1903 edition of The Meditations, and Selections from the Principles of René Descartes (1596-1650), unless noted otherwise. But this undertaking is arduous, and a certain indolence insensibly leads me back to my ordinary course of life; and just as the captive... enjoying in his dreams an imaginary liberty, when he begins to suspect that it is but a vision, dreads awakening, and conspires with the agreeable illusions that the deception may be prolonged; so I... fall back into the train of my former beliefs, and fear to arouse myself from my slumber, lest the time of laborious wakefulness that would succeed this quiet rest, in place of bringing any light of day, should prove inadequate to dispel the darkness that will arise from the difficulties that have now been raised. What is there, then, that can be esteemed true? Perhaps this only, that there is absolutely nothing certain. But there is I know not what being, who is possessed at once of the highest power and the deepest cunning, who is constantly employing all his ingenuity in deceiving me. Doubtless, then, I exist, since I am deceived; and, let him deceive me as he may, he can never bring it about that I am nothing, so long as I shall be conscious that I am something. So that... this proposition I am, I exist, is necessarily true each time it is expressed by me, or conceived in my mind. Thinking is another attribute of the soul; and here I discover what properly belongs to myself. This alone is inseparable from me. I am—I exist: this is certain; but how often? As often as I think; for perhaps it would even happen, if I should wholly cease to think, that I should at the same time altogether cease to be. I now admit nothing that is not necessarily true: I am therefore, precisely speaking, only a thinking thing, that is, a mind, understanding, or reason,—terms whose signification was before unknown to me. But what is a thinking thing? It is a thing that doubts, understands, [conceives], affirms, denies, wills, refuses, that imagines also, and perceives. Assuredly it is not little, if all these properties belong to my nature. At all events it is certain that I seem to see light, hear a noise, and feel heat; this cannot be false, and this is what in me is properly called perceiving (sentire), which is nothing else than thinking. From this I begin to know what I am with somewhat greater clearness and distinctness than heretofore. And in truth, as I have no ground for believing that Deity is deceitful, and as, indeed, I have not even considered the reasons by which the existence of a Deity of any kind is established, the ground of doubt that rests only on this supposition is very slight, and, so to speak, metaphysical. But, that I may be able wholly to remove it, I must inquire whether there is a God, as soon as an opportunity of doing so shall present itself; and if I find that there is a God, I must examine likewise whether he can be a deceiver; for without the knowledge of these two truths, I do not see that I can ever be certain of anything. I have observed, in a number of instances, that there was a great difference between the object and its idea. Thus for example, I find in my mind two wholly diverse ideas of the sun; the one, by which it appears to me extremely small, draws its origin from the senses, and should be placed in the class of adventitious ideas; the other, by which it seems to be many times larger than the whole earth, is taken up on astronomical grounds... These two ideas cannot certainly both resemble the same sun; and reason teaches me that the one which seems to have immediately emanated from it is the most unlike. The idea by which I conceive a God [sovereign], eternal, infinite, [immutable], all-knowing, all-powerful, and the creator of all things that are out of himself,—this, I say, has certainly in it more objective reality than those ideas by which finite substances are represented. Although an idea may give rise to another idea, this regress cannot, nevertheless, be infinite; we must in the end reach a first idea, the cause of which is, as it were, the archetype in which all the reality [or perfection] that is found objectively [or by representation] in these ideas is contained formally [and in act]. I am thus clearly taught by the natural light that ideas exist in me as pictures or images, which may in truth readily fall short of the perfection of the objects from which they are taken, but can never contain anything greater or more perfect. In proportion to the time and care with which I examine all those matters, the conviction of their truth brightens and becomes distinct. As belonging to the class of things that are clearly apprehended, I recognise the following, viz., magnitude or extension in length, breadth, and depth; figure, which results from the termination of extension; situation, which bodies of diverse figures preserve with reference to each other; and motion or the change of situation; to which may be added substance, duration, and number. But with regard to light, colours, sounds, odours, tastes, heat, cold, and the other tactile qualities, they are thought with so much obscurity and confusion, that I cannot determine even whether they are true or false; in other words, whether or not the ideas I have of these qualities are in truth the ideas of real objects. By the name God I understand a substance infinite, [eternal, immutable], independent, all-knowing, all-powerful, and by which I myself, and every other thing that exists, if any such there be, were created. But these properties are so great and excellent, that the more attentively I consider them the less I feel persuaded that the idea I have of them owes its origin to myself alone. How could I know that I doubt, desire, or that something is wanting to me, and that I am not wholly perfect, if I possessed no idea of a being more perfect than myself, by comparison of which I knew the deficiencies of my nature? Whatever the mind clearly and distinctly conceives as real or true, and as implying any perfection, is contained entire in this idea. Although my knowledge increase more and more, nevertheless I am not, therefore, induced to think that it will ever be actually infinite, since it can never reach that point beyond which it shall be incapable of further increase. But I conceive God as actually infinite, so that nothing can be added to his perfection. And in fine, I readily perceive that the objective being of an idea cannot be produced by a being that is merely potentially existent, which, properly speaking, is nothing, but only by a being existing formally or actually. Conservation and creation differ merely in respect to our mode of thinking [and not in reality]. There must at least be as much reality in the cause as in its effect; and accordingly, since I am a thinking thing, and possess in myself an idea of God, whatever in the end be the cause of my existence, it must of necessity be admitted that it is likewise a thinking being, and that it possesses in itself the idea and all the perfections I attribute to Deity. compare Freeman Dyson's "Progress In Religion": "mind... is to some extent inherent in every atom"
When I make myself the object of reflection, I not only find that I am an incomplete, [imperfect] and dependent being, and one who unceasingly aspires after something better and greater than he is; but, at the same time, I am assured likewise that he upon whom I am dependent possesses in himself all the goods after which I aspire, [and the ideas of which I find in my mind], and that not merely indefinitely and potentially, but infinitely and actually, and that he is thus God. He [God] cannot be a deceiver, since it is a dictate of the natural light that all fraud and deception spring from some defect. Just as we learn by faith that the supreme felicity of another life consists in the contemplation of the Divine majesty alone, so even now we learn from experience that a like meditation, though incomparably less perfect, is the source of the highest satisfaction of which we are susceptible in this life. I have been habituated these bygone days to detach my mind from the senses, and I have accurately observed that there is exceedingly little which is known with certainty respecting corporeal objects,—that we know much more of the human mind, and still more of God himself. When I consider that I doubt, in other words that I am an incomplete and dependent being, the idea of a complete and independent being, that is to say, of God, occurs to my mind with so much clearness and distinctness,—and from the fact alone that this idea is found in me, or that I who possess it exist, the conclusions that God exists, and that my own existence, each moment of its continuance, is absolutely dependent upon him, are so manifest,—as to lead me to believe it impossible that the human mind can know anything with more clearness and certitude. In all fraud and deceit there is a certain imperfection: and although it may seem that the ability to deceive is a mark of subtlety or power, yet the will testifies without doubt of malice and weakness; and such, accordingly, cannot be found in God. I cannot, without exposing myself to the charge of temerity, seek to discover the [impenetrable] ends of Deity. But now I not only know that I exist, in so far as I am a thinking being, but there is likewise presented to my mind a certain idea of corporeal nature; hence I am in doubt as to whether the thinking nature which is in me, or rather which I myself am, is different from that corporeal nature, or whether both are merely one and the same thing, and I here suppose that I am as yet ignorant of any reason that would determine me to adopt the one belief in preference to the other: whence it happens that it is a matter of perfect indifference to me which of the two suppositions I affirm or deny, or whether I form any judgment at all in the matter. It is a dictate of the natural light, that the knowledge of the understanding ought always to precede the determination of the will. I cannot... deny that it is not somehow a greater perfection in the universe, that certain of its parts are not exempt from defect, as others are, than if they were all perfectly alike. Every clear and distinct conception is doubtless something, and as such cannot owe its origin to nothing, but must of necessity have God for its author. I will assuredly reach truth if I only fix my attention sufficiently on all the things I conceive perfectly, and separate these from others which I conceive more confusedly and obscurely: to which for the future I shall give diligent heed. Before considering whether such objects as I conceive exist without me, I must examine their ideas in so far as these are to be found in my consciousness, and discover which of them are distinct and which confused. When I imagine a triangle, although there is not perhaps and never was in any place in the universe apart from my thought one such figure, it remains true nevertheless that this figure possesses a certain determinate nature, form, or essence, which is immutable and eternal, and not framed by me, nor in any degree dependent on my thought. When I imagine a triangle, even though such a figure may exist nowhere in the world except in my thought, indeed may never have existed, there is nonetheless a certain nature or form, or particular essence, of this figure that is immutable and eternal, which I did not invent, and which in no way depends on my mind. All that is true is something [truth being identical with existence]. Even when I still strongly adhered to the objects of sense, I reckoned among the number of the most certain truths those I clearly conceived relating to figures, numbers, and other matters that pertain to arithmetic and geometry, and in general to the pure mathematics. It is certain that I no less find the idea of a God in my consciousness, that is, the idea of a being supremely perfect, than that of any figure or number whatever. The existence can no more be separated from the essence of God, than the idea of a mountain from that of a valley. As I may imagine a winged horse, though there be none such, so I could perhaps attribute existence to God, though no God existed. Because I cannot conceive God unless as existing, it follows that existence is inseparable from him, and therefore that he really exists... the necessity of the existence of God, determines me to think in this way: for it is not in my power to conceive a God without existence, that is a being supremely perfect, and yet devoid of an absolute perfection, as I am free to imagine a horse with or without wings. I can conceive no other being, except God, to whose essence existence [necessarily] pertains. It is impossible to conceive two or more gods of this kind; and it being supposed that one such God exists, I clearly see that he must have existed from all eternity, and will exist to all eternity. I apprehend many... properties in God, none of which I can either diminish or change. With respect to God, if I were not pre-occupied by prejudices, and my thought beset on all sides by the continual presence of the images of sensible objects, I should know nothing sooner or more easily than the fact of his being. ...the certitude of all other truths is so absolutely dependent on it, that without this knowledge it is impossible ever to know anything perfectly. This same knowledge extends likewise to whatever I remember to have formerly demonstrated, as the truths of geometry and the like: for what can be alleged against them to lead me to doubt of them? All science depends on the knowledge alone of the true God, insomuch that, before I knew him, I could have no perfect knowledge of any other thing. Now that I know him, I possess the means of acquiring a perfect knowledge respecting innumerable matters, as well relative to God himself and other intellectual objects as to corporeal nature, in so far as it is the object of pure mathematics [which do not consider whether it exists or not]. I observe that a special effort of mind is necessary to the act of imagination, which is not required to conceiving or understanding (ad intelligendum) and this special exertion of mind clearly shows the difference between imagination and pure intellection (imaginatio et intellectio pura). The mind in conceiving turns in some way upon itself, and considers some one of the ideas it possesses within itself; but in imagining it turns towards the body, and contemplates in it some object conformed to the idea which it either of itself conceived or apprehended by sense. I do not find that, from the distinct idea of corporeal nature I have in my imagination, I can necessarily infer the existence of any body. I was readily persuaded that I had no idea in my intellect which had not formerly passed through the senses. Although I certainly do possess a body with which I am very closely conjoined; nevertheless, because, on the one hand, I have a clear and distinct idea of myself, in as far as I am only a thinking and unextended thing, and as, on the other hand, I possess a distinct idea of body, in as far as it is only an extended and unthinking thing, it is certain that I, [that is, my mind, by which I am what I am] am entirely and truly distinct from my body, and may exist without it. It must be concluded that corporeal objects exist. Nevertheless they are not perhaps exactly such as we perceive by the senses, for their comprehension by the senses is, in many instances, very obscure and confused; but it is at least necessary to admit that all which I clearly and distinctly conceive as in them, that is, generally speaking, all that is comprehended in the object of speculative geometry, really exists external to me. On the ground alone that God is no deceiver, and that consequently he has permitted no falsity in my opinions which he has not likewise given me a faculty of correcting, I think I may with safety conclude that I possess in myself the means of arriving at the truth. In each of the dictates of nature there is some truth: for by nature, considered in general, I now understand nothing more than God himself, or the order and disposition established by God in created things; and by my nature in particular I understand the assemblage of all that God has given me. Nature... teaches me by these sensations of pain, hunger, thirst, etc., that I am not only lodged in my body as a pilot in a vessel, but that I am besides so intimately conjoined, and as it were intermixed with it, that my mind and body compose a certain unity. All these sensations of hunger, thirst, pain, etc., are nothing more than certain confused modes of thinking, arising from the union and apparent fusion of mind and body. My body, or rather my entire self, in as far as I am composed of body and mind, may be variously affected, both beneficially and hurtfully, by surrounding bodies. Although there are spaces in which I find nothing to excite and affect my senses, I must not therefore conclude that those spaces contain in them no body... because these perceptions of the senses, although given me by nature merely to signify to my mind what things are beneficial and hurtful to the composite whole of which it is a part, and being sufficiently clear and distinct for that purpose, are nevertheless used by me as infallible rules by which to determine immediately the essence of the bodies that exist out of me, of which they can of course afford me only the most obscure and confused knowledge. Man being of a finite nature, his knowledge must likewise be of limited perfection. A sick man is not less really the creature of God than a man who is in full health. There is a vast difference between mind and body, in respect that body, from its nature, is always divisible, and that mind is entirely indivisible. ...This would be sufficient to teach me that the mind or soul of man is entirely different from the body, if I had not already been apprised of it on other grounds. When a foot, an arm, or any other part is cut off, I am conscious that nothing has been taken from my mind; nor can the faculties of willing, perceiving, conceiving, etc., properly be called its parts, for it is the same mind that is exercised [all entire] in willing, in perceiving, and in conceiving, etc. Our memory can never connect our dreams with each other and with the course of life, in the way it is in the habit of doing with events that occur when we are awake. When I perceive objects with regard to which I can distinctly determine both the place whence they come, and that in which they are, and the time at which they appear to me, and when, without interruption, I can connect the perception I have of them with the whole of the other parts of my life, I am perfectly sure that what I thus perceive occurs while I am awake and not during sleep. The life of man is frequently obnoxious to error with respect to individual objects; and we must, in conclusion, acknowledge the weakness of our nature. On the one hand I have a clear and distinct idea of myself, in so far as I am a thinking, non-extended thing; and on the other hand I have a distinct idea of body, in so far a this is simply an extended, non-thinking thing. And, accordingly, it is certain that I am really distinct from my body, and exist without it. I do not see how God could be understood to be anything but a deceiver if the ideas were transmitted from a source other than corporeal things. It follows that corporeal things exist. They may not all exist in a way that exactly corresponds with my sensory grasp of them, for in many cases the grasp of the senses is very obscure and confused. But at least they possess all the properties which I clearly and distinctly understand, that is, all those which, viewed in general terms, are comprised within the subject-matter of pure mathematics. This page was last edited on 26 February 2019, at 15:09.